Have you heard about the robot bartenders on Royal Caribbean's Harmony of the Seas? 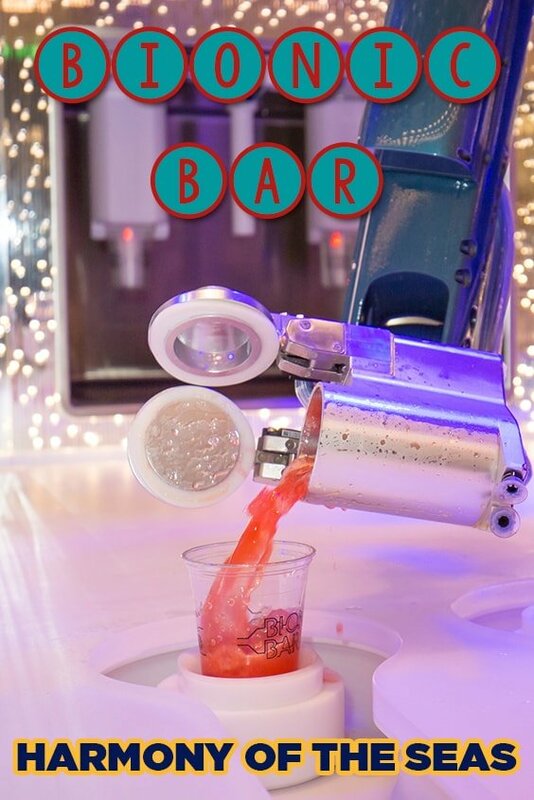 While there are still plenty of bars staffed by human beings, Royal Caribbean created one bar on Harmony of the Seas that has its drinks created by one of two robots! If you want to try the Bionic Bar out for yourself, here is what you need to know about how it all works. The Bionic Bar is located on the Royal Promenade (deck 5) near the aft elevator bank and across the Royal Promenade from Guest Services. The bar features a number of tables and couches that surround the robot bartenders that create the drinks. The Bionic Bar is as appealing to watch as it is to enjoy a cocktail crafted here. You will find quite often many guests simply watching the robots in action, although there is usually plenty of folks ordering drinks as well. To order a drink, guests need to use one of the tablets found at any of the tables in the Bionic Bar. Activate the drink ordering system by placing a SeaPass card or WOWband near the scanner on the top of the tablet. The tablet will verify the guest's age to ensure they are old enough to order drinks. Once in the Bionic Bar menu system, guests have the choice of selecting from pre-defined drink recipes, or creating their own concoctions. You can name your drink, save it for later and customize the drinks to your liking, with the ability to define how many shots of liquor, soda or other beverages in the drink. Keep in mind that the Bionic Bar is limited to liquids that are non-refrigerated. Once the drink order is complete, guests will verify and submit the order. At this point, the guest's drink will appear on the electronic display located to the side of either robot. These displays act as virtual queues, and explain which drink the robot is making and how long until your drink is created. After the robot creates your drink, the robot will place it on the table, at which point you must walk up to the bar, swipe a SeaPass or WOWband at the scanner location, and the drink will be delivered to the end of the bar. What is the price of drinks at the Bionic Bar? The price of drinks at the Bionic Bar is about what you would pay anywhere else for a cocktail on the ship. Drinks ordered by guests will be charged to their SeaPass account. Alternatively, guests with a Royal Caribbean drink package may order drinks at the Bionic Bar and it will be included with their package benefits. Any drinks ordered at the Bionic Bar still come with the automatic 18% gratuity, which is later pooled and distributed to the bar staff.